Bustillo Bros. & Diaz Cigar Co. 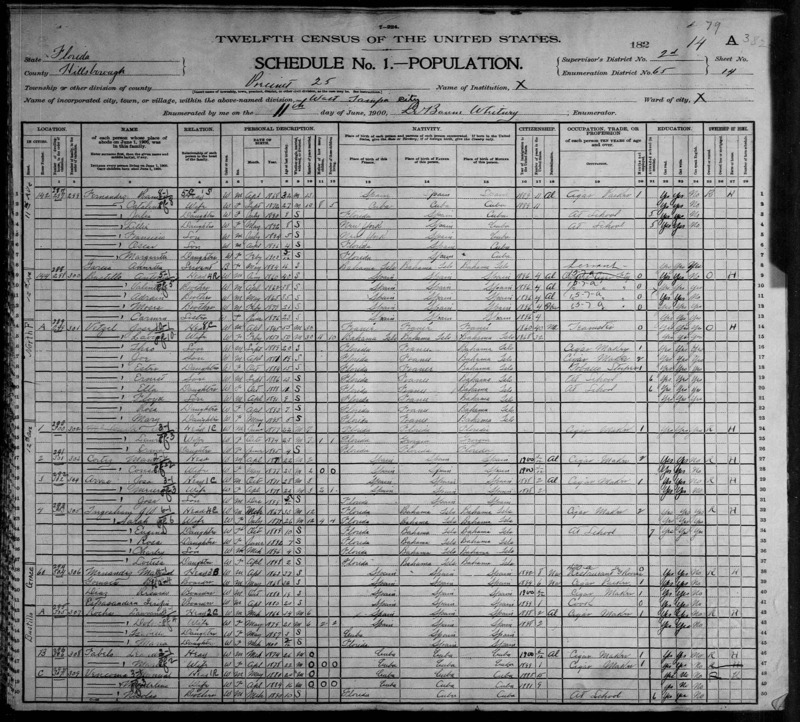 According to this 1900 Census Form , the Bustillo brothers Antonio (1860- ), Valentin (1862- ), Adrian (1865- ) and Moises (1879-1943), were Spanish immigrants who arrived in the US in 1896. According to Armando Mendez in his book Ciudad de Cigars: West Tampa, Bustillo Brothers was started by Valentin and Felipe Bustillo Bengocher when in 1895 they accepted an offer from from the West Tampa Land Development and improving Co. to relocate from Havana. Bustillo Bros. started with great success initially employing 120 workers. In 1897 the company changed its name to Bustillo Bros. & Diaz when their friend from Havana José M. Diaz became a partner. Bustillo Brothers first factory building was loacated at 152-154 13th Avenue. They soon outgrew this space and in 1900 opened a second factory on North Boulevard at the site formerly occupied by the Mark A. Brunner & Co. By 1902 they employed over 500 workers at their two factories. Very soon they had need for additional space and according to this article in the March 21, 1902 Edition of Tobacco publication , they moved to the factory building pictured below in April 1902 and were famous world wide for their Henry the Fourth Cigars. After they moved out in 1902, the factory building on North Boulevard was occupied by a branch factory of the Fernandez Hnos. & Co. of New York makers of El Fastidio and Independiente brands. In January 1914, Bustillo Bros. & Diaz was acquired by the Preferred Havana Cigar Co. but kept operating under the Bustillo Bros. & Diaz name. Preferred also acquired the Ybor City firm of P. Verplanck Co. and relocated it here, in all Preferred acquired 6 cigar manufacturing companies in the Tampa area. Moises Bustillo left the company after the acquisition by Preferred and formed M. Bustillo & Co. with brother Felipe at the old Bolano factory at Howard & St. Louis. In 1919 M. Bustillo & Co. moved to the old Sanchez & Haya Co. Factory #1 in Ybor City where they stayed until it was demolished in 1922. In 1922 Moises Bustillo formed a partnership with Jack Merriam and the company was renamed M. Bustillo and Merriam and established at 17th Ave. & 16th St. in Ybor City. They moved twice thereafter to 2311 18th Street which had been vacated by Marcelino Perez Co. and in 1929 made a final move to the F. Lozano, Son & Co. building. M. Bustillo & Merriam closed for good shortly after Moises death in 1943. This 33,334 sq. ft. factory building at 2111N Albany Avenue, unlike most other cigar factory buildings which were 3 stories high, is a 4 stories high building with the basement floor partially underground. As can be vaguely seen from the inscription on the building, it was in recent years occupied by what appears to be a former City of Tampa agency called the Tampa Inner City Managing Center. This building had other tenants after 1953 when Bustillo Bros. & Diaz ceased to operate and was an operational cigar factory until the mid 1960's. The factory is currently used as office space.